It's all very well getting an LF station sorted out in the comfort of you own home, but doing it in some far-flung place, usually in the freezing cold, is different. May and September 1998, New Galloway. October 1998, the Scottish Highlands. New Year 1999, New Galloway. November 1999. The Isle of Man expedition. 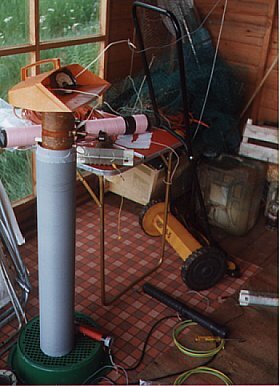 The Guernsey LF DX-pedition, November 2000. The steering feels a bit vague as we set off, it's a good job it isn't dark or the headlights would be illuminating the clouds! We stop for breakfast at Tebay in Cumbria. It's lucky that this coincides nicely with the LF net on 80 so it's on with the mobile whip as soon as we are full of bacon and eggs. I manage to work a few fellow Long-wave types. Just to let them know I'm on the way and, after a few more 80 Metre contacts we arrive at the /P location just in time for lunch... remarkable for the M6 on a bank-holiday weekend! After some refreshment it's down to the serious business of getting the aerial up. I had tried end feeding an inverted L at home and it seemed just as good as the normal tee aerial so I get cracking on that. I want to put the tuning coil in the shed which is in the South corner of the garden. the aerial is to run from there to the North corner. There's a stiff breeze so the arrows I fire keep blowing sideways and looping over the wrong branches. After a few attempts I've got two good anchor points, about 55ft high, for the Southern end of the wire. One of the bootfull of rolls of wire is extracted, a virginal 100M of nice multistrand PVC covered stuff. With enough to reach the shed left dangling the rest is unrolled across the garden, having lobbed the reel over both the electricty and the phone wires of course! It reaches the far corner too easily so I have to cut a few metres off, it'll be too low in capacitance, I'll need extra loading coils, bother. With absolutely no help from the freshening breeze I eventually get a good line over the Northern tree for that end of the wire. It's over a pathetic little twig but it's reasonably high and it has a clear run to tbe Southern support so it'll do. That takes about two hours of running up and down the garden (it's by no means flat!) and I'm knackered. Time to have a go at the earth, this should be easy! I know the earth here is lousy, why didn't I think of it before? I've tried to get Dx signals out on topband from here and verticals just don't work. I have always put it down to poor ground condutivity and here I am expecting to end-feed a pathetically short piece of wire against it. I now have the proof, I have just spent ages trying to bash a couple of 3ft earth rods between the rocks. I've got one in with a few inches sticking out and the other with nearly a foot; but wedged so tightly I can't get it out again so it's going to have to stay. Checking the DC resitance of this fine combination reveals... not 100 Ohms as at home or even 500 ohms but 2k! Something drastic is going to have to be done or no RF is going to be radiated from here! Fortunately. the ever benevolent EC have been handing out fencing grants to anyone with a field, so there are lots of nice shiny new barbed wire fences about, they will be my earth system. I also sneak a clandestine stake into the adjoining field which has a boggy patch within reach, I hope the sheep don't fall over the cable! This has been a very tiring day. I've spent the morning driving here and the afternoon running round and round the garden firing arrows into the trees and unrolling cables. I now have an aerial and I have an earth... well, lots of barbed wire connected together anyway. It's time to set up the transmitter. I fully expected the TX to have fallen to bits. It wasn't built to travel. It's a loose collection of components thrown into a stacking box and held down with sticky pads and tape (well it is amateur radio) but it works! The only problem I have is that one of the power supplies that I brought to keep the saggy old car-battery topped up is not working. I'll sort that out later. To tune up I have run some twin cable along with the coax, down to the shed (aerial tuning hut!) from the shack in the house. I use the twin as an extra-long key lead, when it's plugged into the key socket on the TX, I can fire it up from the comfort of the shed and twiddle with the coils. I'm watching the RF current meter in the aerial now and it doesn't move much! With the same amount of wire at home and the same TX I can get almost 3A up the wire, here I'm lucky to get 1 Amp! The ATU and some lawnmowers (& a dustpan). Still there's one good thing: no noise on receive! If it weren't for the static crashes and the out of band signals coming in well I'd have thought it was a bit too quiet. I put out a few test calls but I'm really not too confident that anyone is going to hear my signals, the ground is so bad, nothing I can do will make a large difference in erp.... at least I can go on the topband net and tell John and Co. that I'm ready to go. I forgot to check the topband aerial, no time to sort it out now. It seems resonant on 1820kHz. Never mind, most people can hear me so at least they will be listening tomorrow morning at 8am for the first attempts at some contacts on 136 from GM. Up at 7.30am and this is supposed to be a holiday! The aerial is still up, the rig still works, I've fixed the PSU (overvoltage trip didn't like being in parallel with another PSU and a battery!) and the band noise is low. CQ, nice clear signal from G3PLX, not exactly DX down to Kendal but a 559 report isn't too bad for starters, perhaps it will work! Next call I hear is G4GVC, how he manages to put out a signal with his low, short wire I don't know but he hears well and gives me an encouraging 559 from Leicester, best DX so far! Next there's G3XTZ Middlesex, he can't hear me too well but we exchange reports OK, I get a 339. Not a bad start but I think I'll add another wire to the top of the aerial to try and increase the current. This breeze is a real pain! Every time I fire the arrow into the tree it blows back and falls out or lands on the top and won't fall through. Umpteenth try lucky and I can now add another 50Mtrs of wire running, at about fifty feet high, from the Southern support towards the North-West. Total length of wire in the air now about 130Mtrs and the current is up to almost l.5Amps. I manage to work G3GR0 in crawley, that's over 300 miles away, I only get 339 but it's not a bad distance. We're out for lunch now so no further activity until this evening. Returning, somewhat the worse for wear I decide to dig a hole at the lowest point in the garden, near the shed and put in a really good earth stake. I dig down about 18", remove a load of rocks and bang in one of my 3ft stakes. The soil I dig out is pure peat, it looks like the stuff you get in grow-bags... no wonder my mother's garden grows so well! Stake well and truly in, I check the DC resistance... 2k again! I try watering the stake in the time honoured way (using nature's natural earth enhancing fluid) and it drops to 1k. What a waste of time! Back in the shack I hear G2AJV in beacon mode at about l835 GMT but can't raise any QSOs so I retire to topband. I get into a good contact discussing all sorts including 136 and eventually G3KEV calls in. He and G3YFN will listen for me so I put out a call on 136. G3YFN in Newcastle gives me 519 on his HF225 and topband aerial and G3KEV gives me 569. He wants to work GM so we QSY down to 136 and exchange reports quite easily even though he is only using l0W of RF. Up early again, 8am seems a good time to work a few. I hear G4GVC working G0ONA who is a good signal. I call him after the QSO but no luck. I work G4GVC again with improved copy both ways. Better signals to and from G3XTZ and G3KEV also but no new ones until G3KZU calls. It's a bit of a struggle but we exchange reports OK so there's another one in the log. I keep putting out CQs on the hour but there's no activity all day. I amuse myself by running a few hundred metres of wire down the grass verge at the side of the road until I reach the first gateway. No barbed wire fence to connect here, stone wall only. Aerial current now l.6 Amps maximum. Although a shower of rain this morning did seem to help... perhaps I should pray for rain? I get a phone call in the evening from Steve GW4ALG who has heard me plaintively calling all day but I have not responded to his calls. We set up a sked for even earlier tomorrow.... holiday lie-ins? Not here! I try the coil on the aerial, tapping up and down the coil with dressmaking pins pushed into the plastic insulation. I can get a maximum of 1.7Amps aerial current now, only a fraction better than with the long thin coil so the coil isn't where the major losses lie.. we all know where that is! Bad static this evening. I hear G3GRO and G3XTZ but they can't hear me. Up with the lark again to no avail. The static is still there and there are no signals audible at 0700 GMT. I go outside to discover that someone has neatly rolled my 'radial' up that was down the roadside verge. Things are different here, at home they'd have pinched it! It seems to make no difference to the tuning or the current so presumably none to the signal either. Mid-morning and I decide to give Finbar, EI0CF, a telephone call as I don't want to miss him from here. No reply from his home number, he must be at work. I put down the phone and wander off into the living room, the phone rings, it's Finbar from work. Must be telepathy! We arrange a sked for about 6pm. The static is bad but we exchange good reports with no difficulty, he is 589 and I get 569. We arrange another sked for tomorrow at 11am when it should be quieter. The telephone is working well today so I decide to give G3LDO a call. Peter would be my best DX if we could work. We arrange to try later and again at 0700hrs tomorrow.... no lie-in again. After a bit of a struggle Peter gets my 579 report and gives me 329, not too good but it is 330miles from here to Worthing. Next I am called by G3KEV again and we exchange 569 reports. A game of Monopoly, which I loose, takes up the rest of the evening. The static was too bad to work much anyway. Up at ten to seven and on the air at 7am for a few fruitless CQs. I doze-off on the sofa until I hear Peter beaconing at 0745.... he must have meant 0700GMT! I could have stayed in bed another hour! We work more easily after I QSY to avoid QRM. I get 539 and G3LDO is still a very good 579 against a quiet background. I notice that I can hear the Loran chatter if I open the RX up to SSB bandwidth. A quick phone call from Finbar to congratulate me on the QSO with Peter is followed by one from John G4GVC wondering where I'd gone as he was calling me. We had another solid QSO at quarter to nine. Off to The Smithy in New Galloway for morning coffee and scones then back to work Finbar. He does some low power tests, reducing aerial current in stages. I can still hear him at 329 with 200mA of aerial current, he is 589 with his normal 3A (reports by ear). An interesting point is that when Finbar was running the same aerial current as me (about 1.5A) the reports were reciprocal. I hear G4GVC and G3KEV after we finish the QSO at about 1200. We are going out to Threave Gardens now, then the aerial will have to come down as we depart tomorrow after breakfast. The rain falls as I wind up hundreds of Metres of aerial and earth wire. I notice that a sheep has chewed its way through one of the earth wires and nearly done the same to another. That could account for the slight drop-off of current from the maximum of 1.7A! I remove bits of the earth system one by one. None makes a big difference but they all help the current a bit, must bring even more wire next time! Whilst some earth remains I try tuning the topband dipole up as a tee. It's a good aerial, one leg is horizontal at 70ft and the coax runs up to one end where the other leg comes down at an angle and doubles back underneath. This works well on 160 as the vertical component gets me some DX but it isn't a tee in the true sense when fed against ground. Even taking care to have the coax well insulated from ground on the way into the shack, I get less than 1Amp up the aerial. It only needs the 1.3mH coil so there's plenty of capacitance. I assume that, as the wires go through the foliage of two wet trees, it is lossy. I am glad that I tried to ensure that the LF aerial was as clear of the trees as possible. Well it all fitted back into the car with some room for the books my wife bought at the Wigtown (Scottish book-town, evidently) bookshops. I've enjoyed it and I've learned a few things, I just wish there were a few more people on the band. Thanks to those who struggled to hear me and apologies to those who called me but didn't make it. There were three QSL cards on the mat when I got home so that was the next task, everyone should have theirs by now! Here is a (very) rough idea of the aerial system..
A second visit was made to Balmaclellan in September with the new rig and loading coil. I forgot the variometer though, and had to use a smaller tapped coil as the variable element, with a ferrite rod stuffed up it! I put just the one 85mtr wire up this time and managed to get it absolutely clear of all leaves and branches in order to keep the Q high. Using only fences as counterpoise, no stakes, I could get 1.7A up the aerial which was as good as I had done last time using a bigger aerial and three earth stakes. I put this down to; better loading coil, less leakage on the aerial and no lossy earth stakes which seemed to lower the Q of the system. I managed to work three stations who had not worked GM before and several others over the weekend. I took the kite out on Saturday afternoon and had a couple of QSOs with very good reports, at least an S point better than the fixed installation. I did suffer badly from static build up on the kite aerial though, which caused a loud rushing noise on receive. The only way to stop it was to fly less wire. I tried 50mtrs and had a good QSO with Kelvin G4WMZ in Huntingdon, so it still gets out OK with the shorter length. Maybe a seperate RX aerial would be a good idea although re-radiation of the noise from the vertical would probably occur. On Sunday morning I heard ON4ZK who could not hear me but, whilst I was calling him, ON7YD heard and called me. Unfortunately I could not hear Rik. That was a very near miss for the first GM/ON QSO! I also heard LX1PD and GW4ALG and worked EI0CF so that was five countries heard from GM over the weekend and two worked. In October 1998 we spent the half-term holiday near Ullapool in North West Scotland. Would we be able to work anyone from up there on 136? All settled in. It's about 10am and I decide to go for a recce to find a site for this afternoons' sked. The one I have in mind is just outside Ullapool near Morefield, where the road crests the hill before dropping down to the Rhue road. It looks OK, there is a track leading up into the hills with room to park at the road junction, some wire fences for grounding, and, on the negative side, some power lines a few hundred yards away. I park outside the cattle grid and get out, the wind is strong and freezing cold and it's spitting with rain. Whilst twisting bits of wire together to connect up the earth my fingers go numb... my morse will be worse than usual! The strong wind makes launching the kite quite difficult. I have a hard time paying out the line without it running away with itself. There's quite a pull on this 8ft kite in a gale! It goes up splendidly though and flies quite consistently, occasionally drifting sideways when the wind gets too strong. I attach it to the car with the usual bungie cord which immediately goes to full extension. Now freeezing cold, I get back into the car and jam the double insulated EHT cable through the window to connect the aerial to the variometer. The tuning seems a bit wierd, I can't get very much current up the aerial and the SWR is poor but I do the best I can and put out a call. Finbar, EI0CF, immediately replies and gives me 589, (he is 599) at least we're getting out... We have a good QSO and I then listen round the band. I am dissapointed to hear strong Loran chatter, probably from the Faroe Islands station, about S5 all over the band. There are also some signals that I don't hear during the day at home: On 135.8 and 136.0 there are teletype signals and on about 136.45 there is a continous carrier. the Mainflingen signal on 138.8 is nice and strong (20 over 9 with the preamp in cct.). No amateur signals are detectable so I decide to meet the rest of the family for coffee and try again at 3pm as planned. I return to the site at about 2.30pm and take a bit more care about connecting the earth wires. There are two fences, one leading North from the gateway and one to the South and I run wires out to them both. The wind is just right now and not quite so cold! The kite goes up beautifully, observed by an old lady and her dog, but as I am attaching the wire to the bungie, sparks start to jump from the free end of the wire to anything nearby... Some of them are almost an inch long! I stand well clear. Trying to manhandle this arcing and fizzing wire is very tricky and I give up for a while whilst it subsides a bit. I scan the band for other callers but can detect nothing amongst the Loran sidebands. I put out lots of calls over the next hour but hear nothing, lets hope someone is listening and passes on a report later. My listening is frequently interrupted by bouts of static. It is possible to predict this. From my vantage point overlooking the Summer Isles, I can see the showers approaching over the sea. Before the rain (or hail!) arrives, the static builds up, then dies away as the rain passes. Unable to copy anything on 136, I put out some calls listening on 80m on the mobile whip but get no response. As the kite shows no sign of coming down I decide to have a quick go on topband and work G3VFF in Birmingham then EI7CS who is 100mls South of Finbar in NW Ireland. Good path to Eire from here! The contact is curtailed by another burst of static heralding the approach of what looks like quite a heavy shower. I decide to get the kite down before it arrives and only just make it! Due to a lack of forethought, I have booked a meal out for 8pm and so have to work the LF net from the mobile on the way to the Altnacealgach Inn near Ledmore. CQ WW is full swing on 160 so the band is full of people shouting "CQ Contest" at 40 over 9 and it's a bit of a difficult QSO! I discover that my signals have been widely heard and that several people were calling me including Steve, GW4ALG and Kelvin G4WMZ who have both been working hard on their systems recently. Steve is keen to try again and will be around tomorrow so I decide to try and find a South-facing slope to operate from in order to screen-out some of the Loran QRM from the North. WE do a Southerly trip today, taking in the Dundonnell Hotel for morning coffee (excellent home-made shortbread! ), the lovely beaches of Gruinard bay and the gardens at Poolewe. The scenery is spectacular with the sun picking out the autumnal colours of the trees in contrast to the distant snow-covered mountains. We end up at the highly recommended Badachro Inn for lunch. It has an old map on the wall showing the local area with the North coast of Loch Gairloch running almost perfectly East-West. If I can find a suitable site near Gairloch it will fit my criterion of a South-facing slope and have a sea take-off. After lunch I suggest that the rest of the family may like to explore the delights of Gairloch (second-hand bookshop etc.) whilst I take a trip out to the West to play radios. I will meet them for tea at about 4pm. Heading West along the road out of Gairloch I eventually find a site which fulfils the requirements just as I arrive at the beautiful "big sand" beach. It has; a parking place on the down-wind side of the road, a wire fence within reach and a reasonable distance before the ever-present power lines. Within 10 minutes I am on the air, Loran is still fairly strong but maybe not quite so bad as before? I put out a CQ and Steve comes back straight away, his signal is easily readable and we exchange reports succesfully. I hope he hasn't spent all day listening for me! 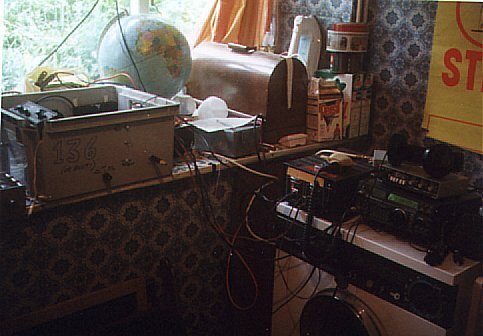 (It was very interesting to learn later that John G4GVC was listening at the time of the QSO and could only just detect my signal whereas he had copied me fine the day before when I couldn't hear Steve.....). No other signals heard so, mission accomplished, I return to Gairloch to discover that the tea shop shut at four o-clock and it's now 5 past! On the way back to Ullapool I have a nice mobile to mobile QSO on 160 with G3NNY/M in Luton and notice some loud static-crashes on the band. I decide not to bother kite-flying this evening. Not quite so bad but still too windy near the coast. We take a round trip via Lochinver and have lunch at the Lochinver Larder pie shop. You can have a three course meal there consisting entirely of pies! I stop at two... After buying some fine but expensive pots at the Highland Stoneware pottery we head off North over the impressive Kylesku bridge and then back South down the A838 through the bleak countryside around Loch More. I fail to persuade the rest of the family to go for a bracing walk whilst I fly the kite in a sheltered glen... I don't suppose I'd have worked anyone anyway! We take a trip to Achiltibuie and stop at the sandy beach at Achnahaird after a fruitless search for a coffee shop that's open. Whilst the others run around the rugged rocks I fly the kite from the small car park near the shore. The wind is strong and the kite's a bit frisky again but it flies well enough at a rather strange angle. I attach some wire to the nearby fence and tune up. There's a lot of Loran noise at this North-facing site and I hear no signals. After a few calls the intrepid ones return and I struggle to pull the kite out of the sky as the rain starts to fall. It does not want to come down, good job I use strong air-frame wire to fly it! We have lunch at the Am Fauran bar at Alltan Dubh, bacon toasties and chips...mmmmm! In the afternoon back in Braes (just out of Ullapool on the South side) I try to fly the kite in the field behind the chalet. This results in a comedy performance of epic proportions with a lot of running up and down the very steep slope like a kid with his toy kite. The thing zooms up, only to turn sharply and dive bomb me, meanwhile the wire gets wrapped around every conceivable piece of bracken or other twig that it can find. The problem is the trees, they break up the wind and cause turbulence near the ground. If I could get the kite above the tree tops there's be no problem but I can't and there is so I give up. Plan B. Put up a long wire aerial. There's a tree at the top of the field into which I chuck a piece of wood attached to some plastic string. The wire is then tied to this and run down the field to the chalet about 80mtrs away. I run the wire over the chalet and down to the car, supported over most of the trees by my 25ft portable mast. A straight length of about 90mtrs is now some 25ft above the hillside of this South-facing slope. With an earth wire clipped to the wire fence around the chalet I tune up and find I can get about 1.5A up the wire, about the same as I got in Galloway but this is a lot further from everywhere...... A bigger problem afflicts receive, horrible wobbly carriers all over the band at about S2 spaced at 100Hz, obviously from some mains appliance nearby. Mainflingen is only 10 over 9 at 4pm and I can't even hear the teletype which was so loud at the other sites, not good. I put out a few calls from time to time until about 5.30pm when I pop down to Ullapool for a Chinese takeaway... amazing, they'll have a Balti-house here next! Monitoring Mainflingen is interesting, it peaks 20 over 9 just after dark then drops back to 15 over for the rest of the evening. No amateur signals heard, I wish my phone worked here... I periodically QSY to 160 where I work a few stations, at least the aerial works OK on topband! I have a listen on the long wire at 8am but the noise is even worse than before at S4 so there's no chance of working anyone. We walk down to the Ceilidh Place for a "Full Monty" breakfast, super sausages! I take another listen at noon and the noise has gone! Although I put out various calls throughout the afternoon I hear nothing so I've no idea whether this is getting out or not. I can now hear the teletype on 135.8 which seems to peak mid-afternoon. There is also a vestige of the 136.45 signal. No signals heard when I listen at 10.45pm on returning from the pub. That makes a grand total of zero stations worked on the long wire. Jam everthing back into the car and head South. I try to call into the 80mtr net but conditions are awful and only the GMs can hear me. So what do we learn from all that then? TX. The portable rig as featured on this site. ATU. 3mH tapped coil on 10" dia x 10" long perspex cage former plus variometer and 3A thermocouple meter in ice-cream carton! Kite. 8ft span delta flown with stranded airframe wire which has plastic-coated fiberglass braid insulation for strength. Rx. IC735 with 9MHz CW filter and additional 455kHz CW filter. 136 BPF and preamp. Datong FL3 audio filter. After reports of terrible weather with 100mph winds and snow, we delayed our trip up to Galloway until 28th December. We arrived about 2pm and I was amazed to see the topband dipole still up in the tree although a little dishevelled! As the winds were light at this time I used the bow and arrow to put up two new halyards which, in conjunction with a previous one, would support a three-wire top with a feeder at the junction of the three. I didn't bother with any earth stakes this time. Wires on to three wire fences which led off in different directions seemed as good as anything. After an experimental tuning up I worked Mal G3KEV. I only got 219 but that was a good sign as the aerial was in a mess, the matching wasn't right and all the earth wasn't connected. Next morning, 29th I got the aerial up properly and ran out the earths. I worked John G4GVC and then Rik ON7YD came on but we couldn't make a QSO. I was suffering lots of noise on receive due to arcing power lines where they had been damaged by the gales. He only had the one day as he was off to EA8 that evening so I decided to go out and fly the kite and try to work him.... big mistake! I arrived home again with one broken kite (the big one) one very wet and tangled one (the parafoil), wet shoes, socks, feet and jeans from an unintentional swim in a muddy bog when trying to retrieve the kite! The wind was just too strong. With a change of clothes I decided to get the base station aerial up to scratch. I disentangled a few wires and re-tuned and at 1520, managed to work Rik after a bit of a struggle with the noise. Over the next few days I steadily improved the system, adding insulators to the ends of the wires ( 1 toothbrush, one nylon bolt and one rawlplug holder ) so that I could run the full output of the 4xIRFP450 rig without the string burning through in the wet. I ended up running 3.5A aerial current and getting 559 from ON and a 579 from around England and Wales. Thanks to those who were patient enough to repeat the reports over and over (especially David and Reino) and alologies to those who I must have missed below the noise. I have been told that the engineers fixed the supply just after we left for home... Oh well, I've left the aerial up so we'll try again later in the year. After more gales there isn't much of the aerial left when I get here. Fortunately, very calm weather means that it's easy to put up three halyards in the optimum positions with the trusty bow and arrow and re-string the 3-wire top with equal, 20mtr, lengths. Three old tooth-brushes are pressed into service as insulators, they are strong, light and long enough to stand the voltage! I haven't got the third halyard up by nightfall but when I tune up to test the TX I am called by G4GVC who gives me 579 with the aerial only half up, not bad..
On Sunday morning I put the last halyard up and haul the aerial up properly. It looks very good and clear of all obstructions, I reckon the average height of the top is about 55 feet ( 17mtrs ). I put out a few calls and work ON7YD, OH1TN ( at 0920! ), G4GVC, G3OLB and G3KEV. I am then telephoned by Andy F6CNI who is hearing me OK and would like a cross-band QSO. I don't have an 80m receiving aerial so we make a sked for 1100 hrs by which time I have strung about 100ft of wire through a tree and into the shack! We work OK although my signal has dropped from when Andy first heard me and telephoned, down to 459. A first QSO with G3XDV rounds off the day when we return from a trip out, then it's time to get the topband aerial sorted out and see if anyone is on the net. Over the next few days activity is sparse (not everyone has this half-term holiday...) but there is some activity in the early mornings and evenings. I call HB9ASB who is a good copy on Tuesday evening but he doesn't appear to reply. Later someone reports that Toni was heard calling me, I don't know whether it was in reply to this call or at another time but it remains "one that got away". On Wednesday I am pleased to finally make a QSO with Dave G3YMC who has been calling me several times. Later the same morning I scrape a QSO with PA0CC, a local noise source starts up just as the QSO begins but we make it OK. I roll up all the earth wires to the barbed-wire fences at lunch time but leave the aerial up. It has withstood a heck of a blow from a cold North Westerly for the last two days (you may have heard the TX trip as the SWR changed..) so it may even still be there for our next visit! Gear used: HB 900W TX, Icom 735 with two CW filters (9MHz and 455kHz), Datong FL3, HB 2mH air spaced coil, Variometer and 3A RF ammeter. Antenna: 3 x 20mtr top wires connected to central feed point (single-wire feed). Top height 17mtrs, feeder length 25mtrs in a dog-leg. Antenna current 3.1A max. Earth: house water piping and three wire fences , each about 150mtrs long in different directions. Flying visit for Easter egg exchange. The LF aerial was still up so set up was quick and I had a good day on Easter Sunday working PA0LQ (new), G4GVC, G3KEV, G6NB (new), G3OLB, EI0CF, MM0ALM (new), GW4ALG and last but by no means least HB9ASB (new!). Monday was similarly busy with G4GVC and G3XTZ followed by PA0AWN (new), PA0SE, G6RO, G6NB, G3KEV and G3CCH. I missed out on OH1TN who had been calling me but no copy my end although the noise level was low. This was doubly odd because I had heard Reino very strongly the previous evening when I was working GW4ALG!